With assistance from the European Journalism Training Association (EJTA) and support of the Evens Foundation the show got on the road. It was just after noon when lecturers started to arrive at the institute, they were cold because of the snow, but mostly happy to arrive in our new building. After recieving a nametag and a programme for the bootcamp, everyone went upstairs to the mediasquare. With views onto our tv-studio and coffee in hand they caught up with colleagues before the bootcamp kicked of. Day 1: Why should we factcheck? Two keynote speakers, prof. Julie Posetti (Head of the Journalism Innovation Project at the Reuters Institute of Journalism at Oxford University) and Jenni Sargent (managing director of First Draft) both spoke about the role of a journalist in the current conflict of wildly spreading des-information. Posetti argues that journalists have to fight back, because when that does not happen, it might have consequenses for press freedom. Besides that, there are a lot of misconceptions about ‘fake news’ which can be dissected into misinformation, disinformation and malinformation. EUfactcheck focuses on misinformation in which false connections between facts are made or there is misleading content. The person distributing it believes it is true. Disinformation is information that false, and the person who is disseminating it knows it is false (read more in Module 2 of the UNESCO Journalism, ‘Fake News’ and Disinformation: Handbook for Journalism Education and Training). 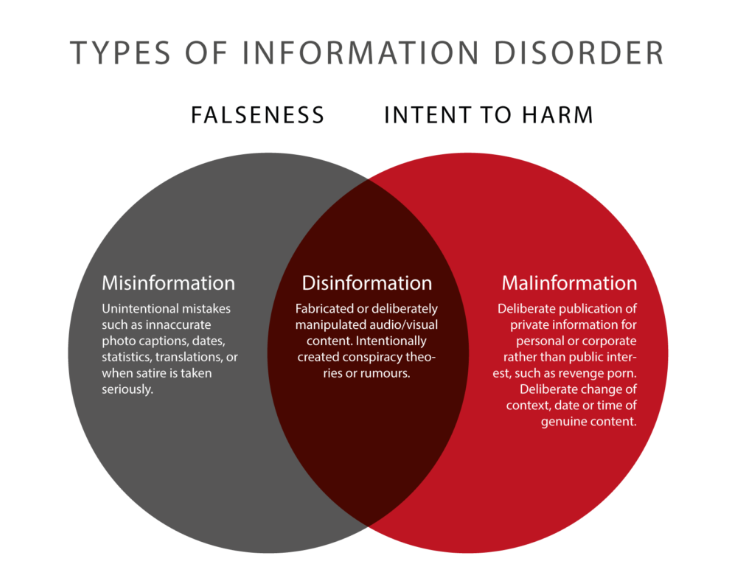 Below is a helpful graphic to distinguish between the types of information disorder. The second keynote speaker, Sargent, explained about the very beginnings of the online verification collaboration ‘CrossCheck’ which aims to provide the public with information to form their own conclusions about the information they receive. With some aspects in common it became clear that our project goals all evolve around the same core issue: getting truthful information out there so EU citizens can make informed choices when casting their ballot in the upcoming European parliamentary elections in May. After this busy afternoon all lecturers worked on another importent aspect of journalism: networking. During the networking dinner all bootcamp participants had a lot to discuss, but most of all the excitement of starting with EUfactcheck was in the air. Day 2: How are we going to factcheck? To keep a website up-to-date with such a big team of collaborators all over Europe is a real challenge. To create a unity on this website is even a bigger challenge. That is the reason why the second day of the bootcamp was all about factchecking and publishing: to get everyone prepared for the task ahead. First of all, it is important to create a good base: how and where do you start your research? As factcheckers we make use of primary and expert sources. Let’s stay away from just Googling. Therefore, local and international journalism students from Utrecht shared their customised database. During a workshop the students explained how to use the database which is an online resource with mostly links and contact details to trusted primary sources and experts. The idea behind the database is simple as you can also search through a variaty of themes (like ‘immigration’ or ‘climate change’) and it will point you to primairy sources for relevant information regarding the subject of the factcheck. The idea is to research in a structured manner, using the database of trusted sources instead of Googling. Once you finished your explorative research, you can start to factcheck. All lecturers in the EUFACTCHECK project use a factchecking flowchart developed by journalism lecturers Wouter Frateur and Frederik Marain from the Artesis Plantijn Hogeschool in Antwerpen, Belgium. The flowchart can be downloaded and used as long as the project is credited. The flowchart assists you step-by-step through your factcheck ensuring you continiously use the proper sources, do not leave out context and are aware of certain alarm bells. After producing a factcheck, there is only one step left: publishing. EUfactcheck publishes according to a publication schedule prepared and kept up-to-date by the project team. Every school now knows when to publish, there will be at least two fact checks and blog posts per week until the elections in the last week of May. If you are interested in our methodology you can read all about it here. Once the bootcamp was wrapped-up, all lecturers recieved a goodiebag containing a true Utrecht reminder: a candle shaped like our famous historic Dom Tower. In the Hide Out, our student bar (what’s a school without a bar?!) all lecturers said goodbye and went their own way – with suitcases rolling behind them, into the cold starry night. But above all: we are now ready to teach our students everything about factchecking and publish the resulting checks on this website!